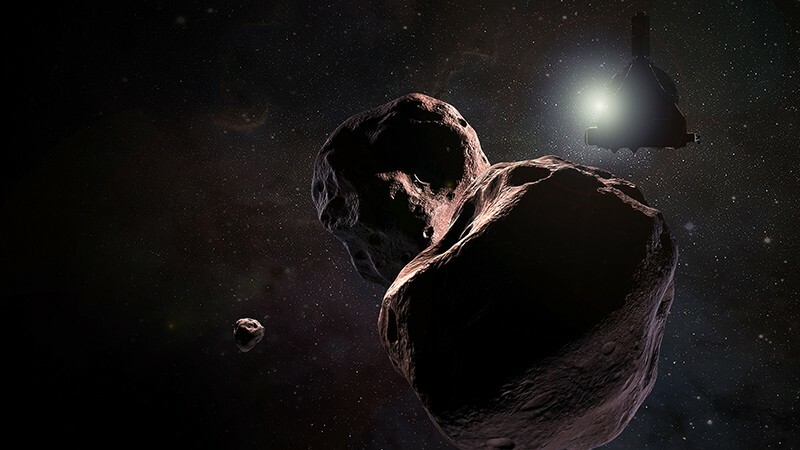 The target of this rendezvous is a small, dark, icy space rock named 2014 MU69. The encounter will be brief — with the spacecraft zipping along at 14 kilometres per second, there won’t be much time for the two to get acquainted. But in the hours and days that follow, New Horizons will send photographs of its visit back to Earth. MU69 will be the most primordial object ever visited, and its appearance could tell scientists more about the disk of gas and dust from which the Solar System coalesced more than 4.5 billion years ago. “We’re going to an entirely new type of world,” says Alan Stern, the mission’s principal investigator and a planetary scientist at the Southwest Research Institute in Boulder, Colorado. MU69 is a lot different than Pluto. 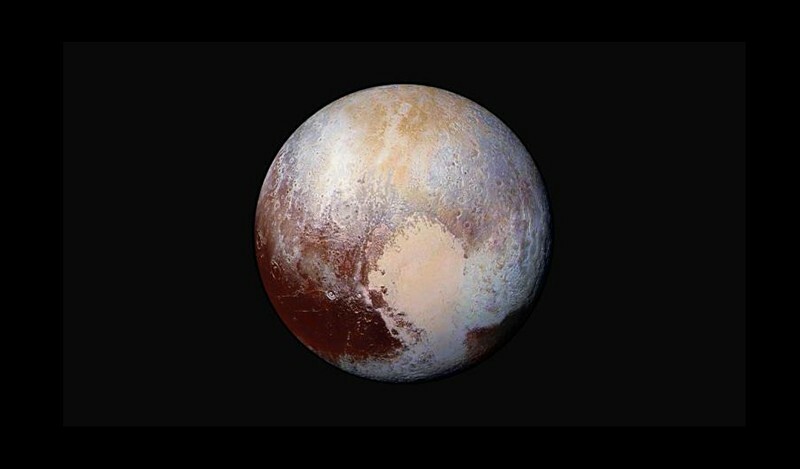 New Horizons made its name in July 2015 as it flew past the dwarf planet Pluto. That visit revealed a staggeringly diverse world with mountains of solid nitrogen, volcanoes that erupt ice, and a thin atmosphere of hydrocarbon haze. Like Pluto, MU69 is a resident of the Kuiper belt, a collection of dwarf planets and smaller rocks that orbit the Sun beyond Neptune. But that’s where the similarities end. Pluto is more than 2,370 kilometres across — big enough to have an internal geological engine that drives activities such as mountain-building. MU69 is a pipsqueak, probably only around 30 kilometres across, and thus might be geologically stagnant. It could, however, be pitted with impact craters or scarred by sprays of debris kicked up by impacts1. MU69 is probably dark, red and lumpy. Beyond that, it could be just about any shape. The space rock is so faint and distant that ground-based telescopes see it as only a pixel or two. Even the Hubble Space Telescope had a hard time discovering it in 2014. New Horizons scientists have had to go to great lengths to work out anything they can about the object before their spacecraft arrives. Three times in 2017 and once in 2018, mission scientists fanned out across the globe in an attempt to capture the temporary shadow created when MU69 passed in front of a distant star. By analysing how the star’s light vanished at different times in different locations, the scientists could tease out MU69’s rough shape. It appears to be elongated, with two lobes like a peanut — but it could also be two objects orbiting one another closely. Such a ‘contact binary’ might resemble the rubber-duck shape of the comet that the European Space Agency’s Rosetta spacecraft studied in 2014. Unlike Pluto, whose orbit is tilted relative to the plane of the Solar System — probably because something once knocked it out of whack — MU69 travels on a mostly undisturbed path around the Sun. That suggests it has been sitting in the deep freeze of the outer Solar System since it formed more than 4.5 billion years ago. It and other objects like it, known as cold classical Kuiper belt objects, are thought to be leftovers from the original disk of material around the Sun that gave rise to the planets. By studying MU69 up close, researchers might be able to better understand other cold classical Kuiper belt objects2. Navigating to Pluto was hard enough, but steering to a tiny world 1.6 billion kilometres beyond Pluto is an unprecedented interplanetary feat. MU69’s nickname, Ultima Thule, refers to a land beyond the known world. New Horizons has been checking its trajectory by photographing distant stars and seeing how MU69 moves against that background. Mission controllers are aiming to hit a rectangle in space that measures just 120 by 320 kilometres, to keep the probe on a path that whizzes about 3,500 kilometres above MU69’s surface. 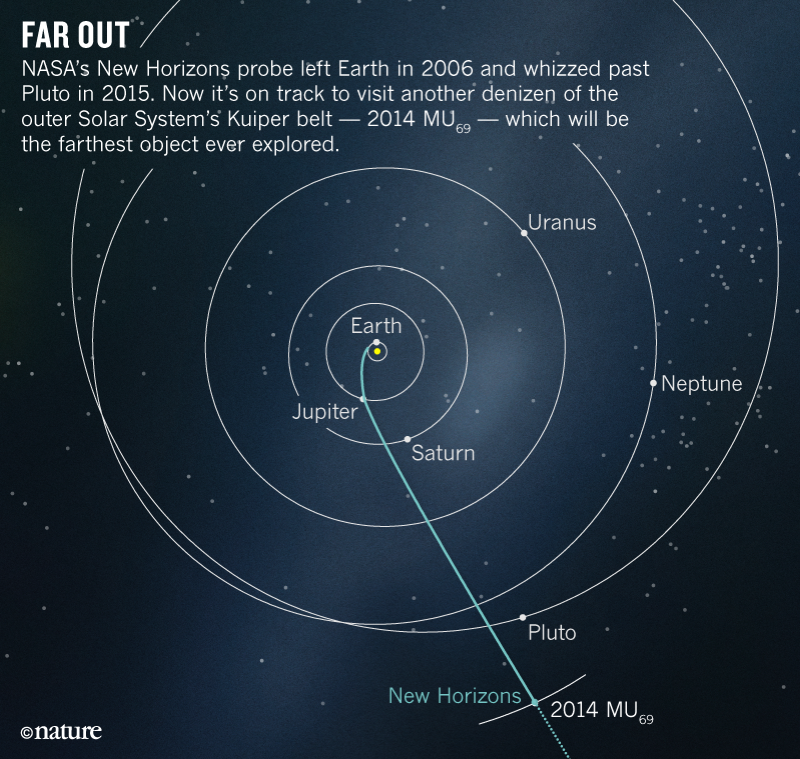 That’s less than one-third of the distance at which New Horizons flew past Pluto. Everything will happen very quickly during the MU69 fly-by, but that doesn’t mean Earthlings will see the results right away. The spacecraft’s closest approach to MU69 will come at 12:33 a.m. US East coast time on 1 January. The spacecraft won’t be in communication with mission control at the time, because it will be busy snapping MU69 as it whizzes past. Then it will take more than six hours to radio that information, at light speed, back to Earth. Moore, J. M. et al. Geophys. Res. Lett. 45, 8111-8120 (2018). Benecchi, S. et al. Preprint at http://arxiv.org/abs/1812.04752 (2018).